These are fantastic! Thanks for sharing...lots to digest here for us AMers besides the gorgeous renderings. Thanks for posting these Victor! It's really great and educational to see how you plan out your scenes. Fun to see how close the final animation actually is to your initial thumbs. Oh these are fun! Thanks for posting them. I miss animation. really great poses. i would love to see some 2d animations from you. All your scenes have such heart in them. It's really cool to see the thought process revealed. Thanks for sharing, dude. curious though, do you always draw poses sequentially next to each other? Because I tend to go back and forth so my sketches aren't as organized. Envy and bribery at its best. Howdy past mentor, These are fantastic. 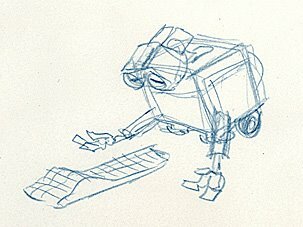 Would it be possible to post a larger version of the "Sequence plan - EVE revives WALL-E"? Its a little small and I would really enjoy being able to read your notes so that it makes more sense. espeically the concept of Eve's emotional arc. These are such a powerful reminder for planning things on paper. Beautiful to see the thought process you might go through before doing a shot. Thank you for posting these! Mark - when I'm exploring ideas I usually do poses everywhere, not necessarily in sequence. Once I come up with a series that I like I draw them in sequence to see how they play together. Sean Brown - howdy past mentee, I'll post a higher res version right now.